Brazil backs Bolsanaro: what next? | City A.M.
I’m an Emerging Markets Economist at Schroders. Financial markets, at least, had been rooting for a defeat of the left-wing candidate Fernando Haddad, successor to former president Lula, on the basis of the very different economic policies espoused by the two candidates. Superficially, this seems odd given that Bolsonaro has repeatedly voted against reform and spoken out against privatisation - he once said former president Fernando Henrique Cardoso should be shot for privatising iron ore miner Vale. However, in his presidential run this is one stance he did moderate, appointing pro-market Paulo Guedes as his economic advisor and now minister. Haddad, meanwhile, remained staunchly anti-reform, anti-privatisation and in favour of more spending. However, we still have some concerns around Bolsonaro's Damascene conversion to the cause of free markets. Guedes is not the only adviser he has, and others on his team oppose the ultra-liberal stance Guedes takes, particularly on privatisation. Meanwhile, other key figures, including his likely chief of staff and one of his four senators, seem strongly opposed to desperately needed pension reform. On top of these internal divisions, Bolsonaro must also contend with a fragmented legislature. This is a cause for concern, given Bolsonaro's limited ability as a political operator; he will need to draw allies with skill in negotiating the legislative process. Brazil's largest single economic problem at present is its fiscal position. Government debt-to-GDP is remarkably high by emerging markets (EM) standards at 84%, and is set to climb further thanks to sizeable deficits (7.8% of GDP in 2017, including interest payments) with the International Monetary Fund projecting gross debt to hit 95.6% in 2023. 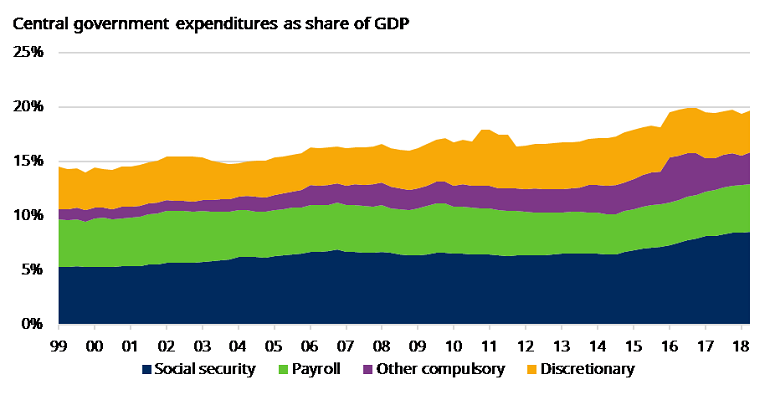 The lion's share of Brazil's budget expenditure is taken up by social security benefits, particularly pensions; a problem which grew notably under Dilma's government. As has been highlighted in The Economist and elsewhere, Brazilian expenditure on pensions is as high as that seen in Europe, despite wildly different incomes and demographics. Pension reform is therefore key to addressing Brazil's dire fiscal outlook. In its recent Article IV consultation, the IMF argued that to stabilise pension spending as a share of GDP, reform would need to increase retirement ages, de-link the minimum pension from the minimum wage, and reduce the generosity of public sector pensions in particular (80% of pension payments currently go to the public sector). It would also be helpful to reduce payroll expenditure, simplify the tax code (particularly by reducing exemptions) and tackle the broader problem of mandatory expenditures. Pension reform though is key as being symbolic of intent, as well as the largest single ticket item of expenditure. Bolsonaro's apparent embrace of economic liberalism has been key in changing attitudes from investors. Business confidence in particular has rebounded from its lows this year, which should be positive for investment, while Brazilian assets have seen a resurgence of interest, in part because they offer a rare good news story in a torrid year for EM. Is the market fall cause for alarm or calm? It seems likely that this initial optimism could extend to euphoria for a while. Assuming no unforced errors on the part of Bolsonaro, the first reality check for investors is likely to come in the second quarter of 2019, when a post-Carnival legislature comes to the practicalities of passing tough bills (legislative recess will begin on 22 December and end only on the 4 February, one month before Carnival). Until that point, markets should feed largely on the signals sent by the incoming president. Signs that Guedes is being side-lined (or that the corruption investigation could remove him) or that Bolsonaro is finding it harder than expected to build an allied legislative base, could knock the rally off course. On the other side, should Bolsonaro manage to attract experienced political names, this would further raise the perceived odds of passing tough reforms, given his own limited legislative experience (he has co-authored only two pieces of legislation in a near 30-year long career). On the macroeconomic side, the sheer relief at having avoided a leftist government should see a lot of deferred investments finally break ground. Currency strength after a period of weakness will also help calm nerves on inflation and the direction of interest rates. We would expect economic growth to begin accelerating, which should also have the effect of boosting Bolsonaro's political capital at a crucial moment. For now though the Brazilian story seems a good one. We will keep an eye on Bolsonaro for signs of wavering policy intent, or even a preference for prioritising social legislation over fiscal issues. Should he fail to deliver, a sharp unwind seems likely, with particular pain in the fixed income space given the extremely challenging fiscal outlook. 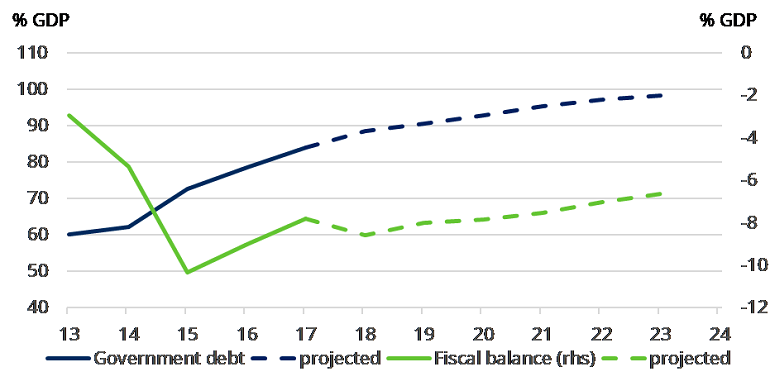 “Pension reform and ongoing fiscal discipline is deemed to be critical to medium-term fiscal sustainability in Brazil. The performance of Brazilian assets is likely to depend on the extent to which the Bolsanaro administration delivers appropriate policy measures. Should the government fail to pursue sufficiently conventional economic policies, it is likely that the bond and currency market reaction would pressure the government to consider a more orthodox policy framework. As a result, we have conviction that fiscal sustainability will be addressed in the medium term. What might trigger the next global financial crisis?